This Saturday, the zombies will be out en masse. At 7 p.m., scores of walking dead will begin shambling on for the third annual Zombie Walk from the Boulder Dam Brewing Co. through downtown Boulder City. Zombies, zombie hunters and humans of all ages are welcome to party and enjoy entertainment from three live, or perhaps they’re masquerading as live, bands: “nerd punk pioneers” 3d6; blues band Tru-Blue and rockers Bad Mojo. There will also be plenty of food to choose from on the brewpub’s menu as well as brewed-on-the-premises beers. Proceeds from the event will be donated to the Nevada Veterans Assistance League that supports the residents of the Nevada State Veterans Home. There’s a $5 donation to participate in the Zombie Walk which, along with the sale of raffle tickets and $1 from each drink, will support the league. The money goes directly to support the requests of the residents of the veterans home to fund outings such as trips to museums and theatres, shows on the Strip and sporting events. “People who come to this event want to party,” but they also want to know where the money is going, said Todd Cook, head zombie, master brewer and owner of the Boulder City Brewing Co. He’s pleased to donate to the league and wanted folks to know that their donations will support the local heroes at the home. People buying raffle tickets during the event can win prizes including a Hawaiian vacation, safety and emergency preparedness items, gift certificates on Flight Linz Bootleg Canyon. The Boulder City Zombie Walk began in 2011 when members of the Las Vegas chapter of the Zombie Squad, a national charitable organization that also teaches emergency preparedness, asked Cook to partner with them on this activity. Being a fan of scary movies, and already involved in charitable events in town, Cook decided to make the Zombie Walk an annual event. Zombie Walks 2011 and 2012 were “awesome,” Cook said, and have grown from 100 walkers to 150 last year. He’s hoping for an even bigger assortment of gory, gruesome and grotesque walkers this year. Besides hosting the Zombie Walk, Cook has been heavily involved in community organizations since he moved to Boulder City in 2006. Among other things, Cook is the president of the Sunrise Rotary Club, served as a board member of the Boulder City Chamber of Commerce and participated in the 2013 Relay for Life, where his team was the top fundraiser. 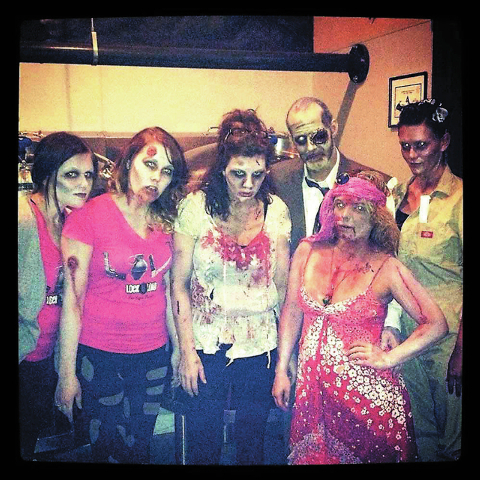 For more information on the third annual Zombie Walk at the Boulder Dam Brewing Co., visit www.boulderdambrewing.com where you can check on other upcoming brewpub events.